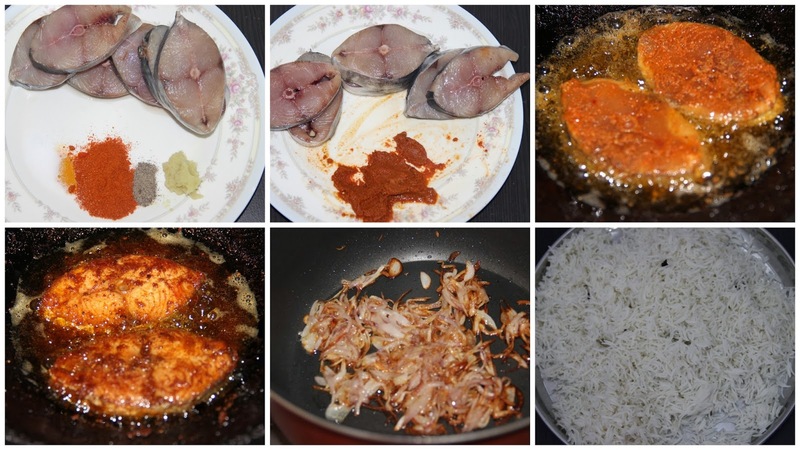 Fish biryani is a easy to prepare biryani. Especially at this festive season, a perfect dish to try. Sea food lovers adore this biryani.This perfect blend of fish and rice in the form of biryani will make your dish so special. For all fish fans this will be delightful dish. Make your dinner party exclusive. Half cook the rice with salt and raw garam masala. Drain excess water and allow to cool. Deep fry the onions till golden brown and crispy. Retain the oil. Marinate the fish with turmeric, chilli powder, pepper, ginger garlic paste and garam masala. Allow to soak for 10 minutes. Fry the fish till done but not too crispy. Coat the rice with ghee and the onion fried oil. In a deep sauce pan add the rice in one layer then keep the green chillies, coriander and mint leaves, fried onion , sprinkle some garam masala and lime juce. Arrange the fish then keep another layer of rice and add the turmeric/ saffron dissolved coconut milk. Close the pan with aluminium foil then cover tightly with the lid. Keep under dum for 20-25 minutes. Less time is enough because the contents inside are already cooked. Garnish with fried cashews, chopped coriander leaves and fried onions. Note: If you like gravy in this biryani, saute some chopped onion and tomato well and add in the middle biryani layer. Wow ! Nice flavors and aromatics are used here and biryani looks tempting , will try it with paneer :) Being vegetarian ! Delicious biriyani.. and thanks for dropping by and following... happy to follow urs too. Dum biryani looks very tempting. 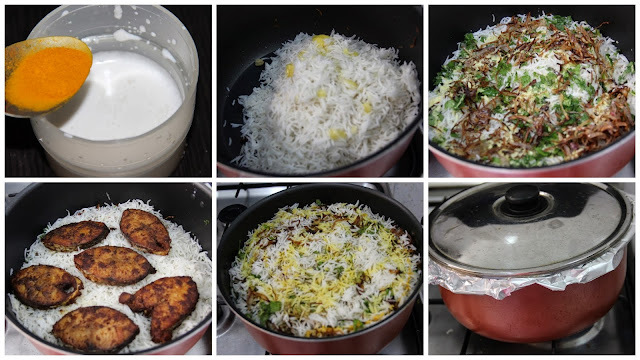 Just as I was going mad on what to cook this weekend, I see this fabulous fish biryani. Never made before but now with your recipe, I am feeling confident. Only that cooking rice on the stove is quite scary for me because I have always used the rice cooker. Anyway, I shall definitely try. Dear Lincy, thank you for the fish briyani recipe ..i got it right in my first attempt and our family enjoyed every bit of the dish. Credits to your simple and easy recipe.